At SmartCart, we have an in-house, professional team of web designers, developers, and SEO experts that specialize in creating extraordinary websites for companies that sell online. For more than 20 years, our talented team has been developing websites that turn visitors into valued customers. From concept to completion, SmartCart websites are as skillfully crafted as they are effective at selling products, services, concepts, experiences - and more! What can I expect with a Platinum Website Design? A Platinum Website Design provides your company with a complete website solution: a top-notch, custom designed template website with an interactive home page display for your SmartCart website. Your website's design will not only reflect your unique business style and attitude, but above all, it will showcase your business in a professional manner. In addition to design, we optimize your website to get the best results on search engines like Google and Bing. Essentially, not all websites have the same needs. The features listed above are offered as as a guideline of what can be included with a Platinum Level Design. A design consultant will personally review your online business's needs and provide an outline of the project detailing specific pages to be developed and personalized aspects of the website design. What is the difference between a Gold and Platinum Website Design? A Gold Website Design has many of the same features as a Platinum Design, but it is basically a custom designed theme and home page for your website. Your website design will feature a responsive framework and includes page level search engine optimization, but it may not include features such as logo development, sitewide SSL, or additional web page design. As a special bonus, you can recieve one year of SmartCart Enterprise hosting at no additional charge with a Platinum Design. Because each website project is different, a professional design consultant will personally review your online business's requirements and provide you with the best options based on your needs and budget. My company has a limited budget for design services. Can you help me? Absolutely! SmartCart can help you get a great website for any budget. Contact us for a personalized web design quote based on your budget and needs. Does SmartCart offer WordPress website development services? Yes, SmartCart can design your website on WordPress and other various platforms. The current options for design publishing platforms are SmartCart (default), WordPress, and FTP Upload. How long will a new website design take to complete? You can expect up to 2 weeks for a Gold Level design and up to 3 weeks for a Platinum Level design. Your design consultant will provide the complete details based on your project and our current production schedule. Do I own my design? Yes, any custom design work that is designed specifically for your business is 100% yours to own once the project is paid in full. What if I do not like my website design? Based on past projects, most of our clients love their new design at first site, but we expect that there can be updates and modifications to the proposed design. You are given the opportunity to fully review your project and provide us with your feedback. We will gladly adjust the design to your liking. Your website project is complete once you are 100% satisfied with your website. 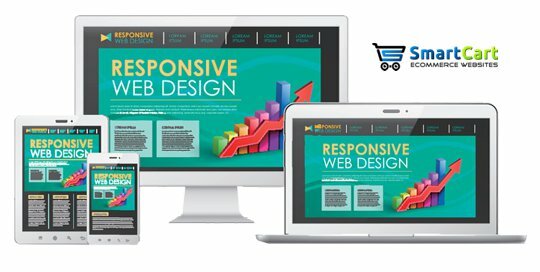 Responsive Web Design (RWD) is a Web design approach aimed at crafting sites to provide an optimal viewing experience, easy reading and navigation with a minimum of resizing, panning, and scrolling across a wide range of devices (from mobile phones to desktop computer monitors). Can I view examples of your design work? Yes, visit our Design Gallery for our most recent website design and development projects. I already have a website. Can I get my SmartCart web store to match my existing design? Yes, if you are familiar with HTML, you can import your existing design into SmartCart. SmartCart also provides a website design integration service that will help you achieve the same website design on your ecommerce site that is on your existing website. Do I need to host my site with SmartCart to get a custom website design? It is not a requirement to host your site with SmartCart to receive custom website design services, but complications may arise if your web server does not support all of the features needed to support your website programming. We guarantee optimal performance from your website when it is hosted within the SmartCart Network. How long has SmartCart been in business? SmartCart has been serving and developing ecommerce websites since 1995. In 2017, we celebrate 22 years of dedicated service!